Pragmatic Play presents Mighty Kong Slot at Wicked Jackpots. It is a 5-reels, 50-paylines slot. On this game, relive the story of the giant gorilla, King Kong, discovered on Skull Island. After being discovered, it was captured and sent to New York only to entertain the public. On the background of this slot, you can see a dense forest, with the reels framed with film reels. 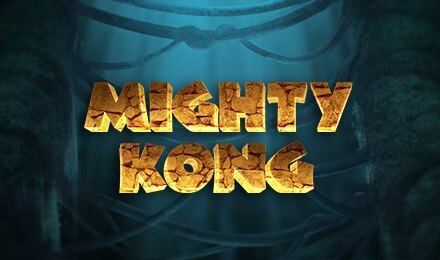 The following symbols are found on the reels of Mighty Kong Slot: Ann Darrow, Carl Denham, Jack Driscoll, 10, K, J, Q and A. Their pay-outs are £50, £25, £12.50, £7.50, £5, £4, and £3.75 for 5 of a kind. As you spin the reels, form combinations of these symbols to trigger a win. Start your game on Mighty Kong Slot by adjusting your stake using the + and – buttons. Click on the Spin button to activate the reels. Want to speed things up? Make use of the Auto Play feature to enjoy 10, 20, 30, 50, 70 and 100 automatic games. Bet Levels: Choose from 1 to 10 bet levels. Amount of Paylines Selection: There are 50 fixed paylines which cannot be modified. Coin Values: Default coin values are £0.01, £0.03, £0.05, £0.10, £0.20 and £0.50. The WILD symbol replaces all other symbols apart from the Scatter. On reel 3, it expands to fill all the positions and thus, creates more winning opportunities. The Scatter is represented by King Kong himself. It contributes in triggering the Free Spins Feature. The Free Spins Feature is activated with 3 or more Scatters. During this round, select the amount of spins you wish to play. Earn extra free spins with 3 or more Scatters during this feature.